The new MailOnline trainees had a good first week in Kensington. They had sessions with editor Danny Groom, executive editor Ian Walker and deputy SEO manager Rena Burton. The trainees also wrote headlines, intros and stories. The award for best headline of the week went to Raven Saunt and the best intro to Emily Webber. 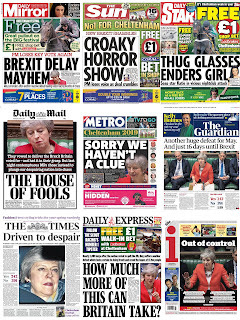 As usual we finished with the newsquiz. This week's top scorers were Emily and Jemma Carr on 15. Well done to both. The top solo online scorer in last week's quiz was Gavin Devine with 18, ahead of Liz Gerard on 17. The top team was Bruce and Sarah Hayward with 18.5. Here's this week's quiz ... as usual 25 questions about the week's events. Give it a go and see if you can beat Jemma's score. 1. Theresa May's Brexit deal was defeated by what size majority in Parliament on Tuesday night? 2. The 'gang of four' rebel Cabinet members who defied Theresa May and helped stop a No Deal Brexit included Scottish Secretary David Mundell, Work and Pensions Secretary Amber Rudd and which two others? Half a point for each. 3. 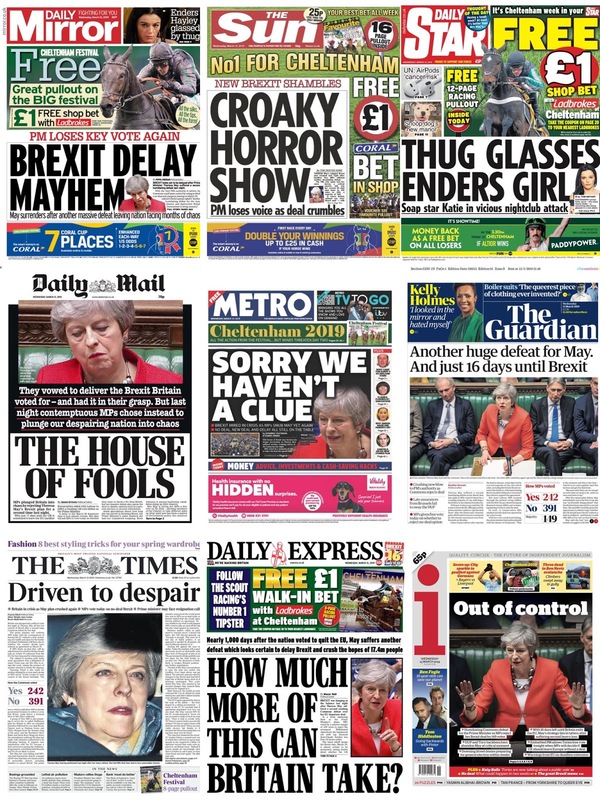 The Ministers used what codeword to help inflict a defeat on the Prime Minister and stop a No Deal Brexit in the Commons on Wednesday? 4. MPs backed the motion to delay Brexit to avoid a no-deal departure on March 29, meaning leaving the EU will now be delayed until what date at the earliest? 5. Comparing Theresa May and Attorney General Geoffrey Cox to Adam and Eve, Boris Johnson said: 'They have sewed an apron of ____ that does nothing to conceal the embarrassment and the indignity of the UK.’ What is the missing word? 6. Who said of Brexit this week: 'I gave the Prime Minister my ideas on how to negotiate it ... she didn’t listen to that and that’s fine. She’s got to do what she’s got to do'? 7. In his spring statement Chancellor Philip Hammond announced that ‘fossil fuel’ heating in new homes would be banned from what year? 8. Chancellor Philip Hammond also announced that he had ‘decided to fund the provision’ of what in secondary schools and colleges from September? 9. A 28-year-old Australian, who livestreamed himself attacking a mosque killing at least 49 people in Christchurch, identified himself online before the rampage by what name? 10. Northern Ireland’s Public Prosecution Service announced that a former British paratrooper is to be charged in connection with the killings of civil rights demonstrators on Bloody Sunday in 1972. For legal reasons the soldier is being referred to by what letter? 11. Ethiopian Airlines Flight 302, which crashed shortly after take-off on Sunday killing all 157 people onboard, was flying to which city? 12. Which is the only airline to have any Boeing 737 Max 8 and 9 registered with the UK's Civil Aviation Authority? 13. Which company apologised to trainee accountant Emily O’Connor, 21, who was threatened with being thrown off a flight because she was wearing a crop top? 14. How many weeks was Paul Mitchell jailed for after running on the pitch and punching Jack Grealish in the Aston Villa versus Birmingham derby? 15. How did Bryony Frost, 23, make history this week? 16. British backpacker Catherine Shaw was found dead in a mountainous area of which country? 17. American actresses Lori Loughlin and her husband were accused of paying $500,000 in bribes to have their two daughters admitted into which university? 18. How did 30-year-old Tom Ballard die? 19. Why was 61-year-old Patricia Dowdy in the headlines? 20. Who issued a statement saying: 'We did not see – and still do not see – how this programme will help the search … and, particularly given there is an active police investigation, it could potentially hinder it’? 21. Which football club announced a compensation scheme for the victims of sexual abuse by one of its former coaches? 22. Which title did Prince Edward receive from the Queen to celebrate his 55th birthday? 23. Which breed of dog was crowned Best in Show at Crufts? 24. Which two bands were announced on Friday as headliners at this year's Glastonbury alongside Stormzy, Kylie Minogue and Janet Jackson? Half a point for each. 25. What started with Beyonce’s Crazy In Love and finished with Survivor by Destiny’s Child?